The SIO EM receiver is a completely autonomous seafloor data logging system based on over 2 decades of development at Scripps Institution of Oceanography. We currently have a total of 54 broadband seafloor EM receivers. Developed to routinely collect seafloor MT and EM data for petroleum exploration, the Scripps EM fleet has seen over 1000 deployments in the last 8 years, with an average instrument loss rate of less than 1% and data recovery rate of 98%+. This unrivaled number of deployments for both industrial and academic experiments has resulted in a robust and highly reliable instrument system. A diagram of the instrument configuration is shown in in the figure on the right. Each instrument is outfitted with a state-of-the-art, 8 channel, 24-bit data logger. Logging electronics reside in a 7075-T6 aluminum tube which is anodized and painted to resist corrosion by seawater and terminated by two end-caps sealed with O-rings. One end cap has ports to communicate with the computer and to purge damp air from the instrument. The other end cap has high-pressure, underwater connectors for linking the sensors to the logger inputs. The entire system is capable of resisting water pressure to depths of 6000 m.
The noise floor for the analog-to-digital converter is 10-13V2/Hz at 0.01 Hz to Nyquist. Maximum sampling rates are 1,000 Hz on 4 channels. Power consumption for 4 channels at 32 Hz sampling is 450 mW. One set of primary lithium batteries will power the logger for up to 2 months (we've achieved similar endurance using NiMH). Since all the seafloor instruments are autonomous, accurate timing must be accomplished by on-board quartz clocks. The data logger is timed by a custom low-power oscillator built for SIO with a timing accuracy of about 4 x 10-8. Phase locked loops provide all the frequencies required by the system, such as the 40 kHz CPU clock, the 2 kHz for the E-field chopper amplifier, the ADC clock, sample interrupts, and the software real time clock. The on-board clocks are started using a GPS time standard, with initial timing accurate to 1-10 microseconds. After recovery, clocks are again checked against the GPS standard to estimate drift or error. Drift rates are typically 4 ms per day or so. Data are stored on a Flash-ROM drive, capable of recording for up to 2 months. Programming of the logger for deployments is done through a serial port connection and recorded data is retrieved via an ethernet interface or by removing the flash card. An onboard electronic compass and tilt meter record the instruments orientation on the seafloor. A system of low noise and low impedance silver-silver chloride electrodes and an AC-coupled electric field amplifier [Webb et al., 1985] measures the horizontal electric field at the end of 10 m long dipoles. Electric field noise on the electrode and amplifier system using a 10 m antenna is about 10-10V/m/sqrt(Hz) at 1 Hz. Horizontal magnetic fields are measured using sensitive and low power induction coil magnetometers designed at Scripps Institution of Oceanography. This configuration makes the instrument capable of measuring both electric and magnetic fields in the .01 to 10,000 s period range, although the attenuation of the natural source MT fields through the ocean limits the shortest periods to about .1-10 s, depending on the depth of water. The logger pressure case is supported in a polyethylene framework which protects the instrument from damage during handling and supports a pack of four glass flotation spheres, the acoustic release package, and sensors. 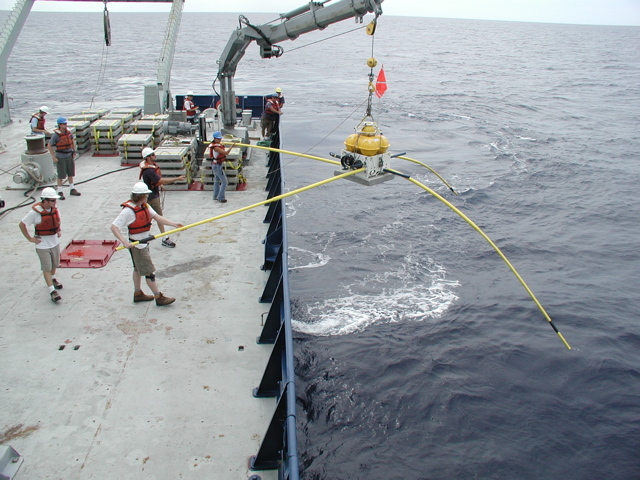 A 150 kg concrete anchor stabilizes the instrument on the seafloor. Early test deployments utilized lead weights for anchors and often suffered from motion of the instrument frame seriously corrupting the magnetometer data. 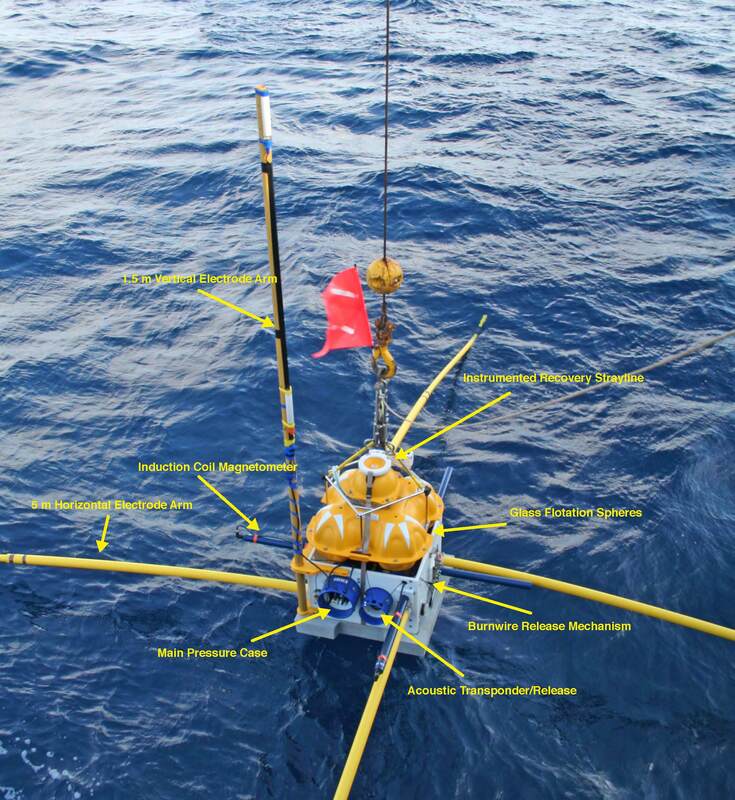 An independent acoustic unit is used to track the instrument through the water column during deployment and recovery, and also for releasing the instrument from the anchor. When the acoustic unit receives a "release" command form the ship, it sends a current from the 18 V internal batteries to a short stainless steel burnwire connected to a mechanical release device securing the concrete anchor to the instrument frame. Within about 4 minutes this positive voltage causes the steel wire to electrolyze away, releasing the anchor from the instrument and allowing the positively buoyant package to float to the surface for recovery. Acoustic surveying of the instrument using this system can determine the seafloor location to within a few meters. 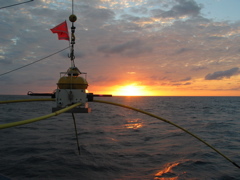 A stray-line buoy containing an LED strobe light, GPS receiver, and radio modem ensure instrument recoveries can be performed at night and in limited visibility conditions during daylight. In addition to allowing the instrument to be located on the sea surface, the strayline buoy is integral to easy recovery of the instrument in all weather conditions by being attached to the instrument frame via a 10 m polypropelene rope. 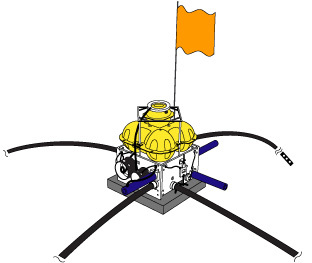 During an instrument recovery, the ship will drive up to about 5-20 m away from the floating instrument and the strayline rope is hooked using a SIO designed floating plastic grapnel. The strayline is then detached, and the instrument hooked to a small ship's crane, which lifts the instrument aboard.